In 1981, when I was 16, my parents let me travel by myself for the first time, so I jumped in a car with a friend and took off for West Berlin. Back then, my home town, Vienna, was ultra-conservative and lacked a scene that a nonconformist like myself could have found a place in which to flourish and enrich my young life without being damaged. On our first night in Berlin, we went to Dschungel Club at Nürnberger Straße 53, a former high-class Chinese restaurant designed in Bauhaus style by Chinese architect Chen-Kuen Lee during the 1960s. From outside you could see palm trees and potted plants surrounded by cigarette smoke through the milky window. They had a tough door policy, but with my extravagant androgynous looks and my pompadour I had no problems getting in. 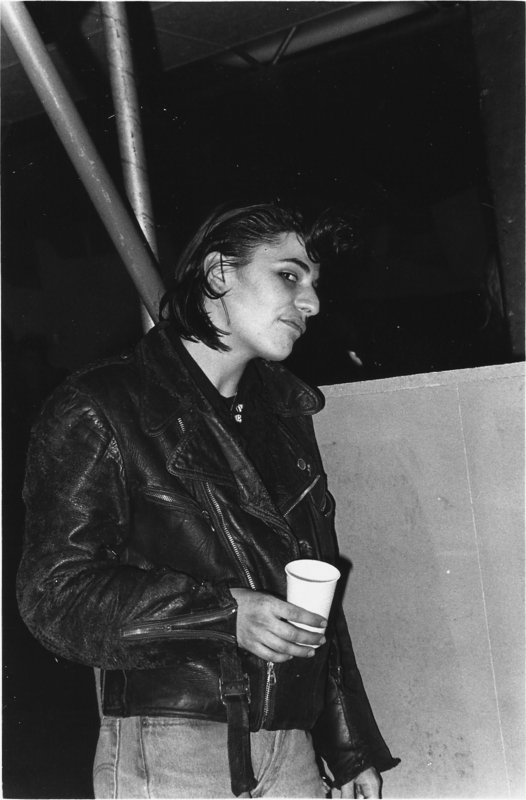 They always made sure to get the perfect mix of people and carefully selected them at the door: there were punks (like the legendary Ratten-Jenny), skinheads, rockers, teds, new wavers, gays, actors, hippies and artists, from David Bowie to Martin Kippenberger to Michel Foucault. The spiral staircase leading up to the cocktail bar on the gallery, the fish tank, the little fountain, and the black and yellow tiled floor were all leftovers from the Chinese restaurant. And the blue corduroy couches, the Eames wire chairs and trapezoid tables were original pieces from the ’60s as well. Working at the cloakroom, a still underage Mark Brandenburg, completely clad in Vivienne Westwood, took our coats. They played London underground and mainstream music like Malcolm McLaren, The Normal and Tuxedomoon, but also a lot of black music, reggae, soul and disco—whatever was danceable. When I first came in, Alan Vega’s “Jukebox Baby” was playing, which was my favorite song at the time. I spontaneously started dancing. The rather small dance floor was located at the back of the club. Behind it were the stairs leading to the toilets, so there were constantly people traversing the dance floor to go powder their noses, which nobody seemed to mind at all—quite the contrary. That very first night I became friends with a musician I still consider one of my closest friends today, 34 years later. And the day after, I fell in love with a record salesman at a reggae concert at Waldbühne, a large outdoor venue which still exists today. During this intoxicating week I realized that there would be no other way for me but to escape to Berlin. When I got back to Vienna, I told my parents that I didn’t want to go back to school and would instead seek my fortune in Berlin. Of course I got a vehement “Not until you’re 18!” in return. I quit school, got a job at a jeans store and used the money I made to take trains through the bleak east to Berlin as often as possible, where I continued working on my future home base social network. I also invested in a pair of blue Blue Moon suede creepers, music from the record store Zensor and Black & White pomade for my hair. I kept running into Blixa Bargeld at the Dschungel, whom I had met at an Einstürzende Neubauten concert at U4 in Vienna. He was a lanky, androgynous guy with asymmetrical make-up and carefully tousled hair who liked to combine ballet unitards with black latex and rubber boots. Blixa gave me hope for my upcoming move to Berlin. With my unusual looks I would surely be able to get a job at Risiko [a legendary Berlin bar where Bargeld worked]. He would be there to help by recommending me. And he was right: when I moved to Berlin in December of 1982, shortly after my 18th birthday, everything went swimmingly. Through my Austria connection I was able to get a kitchen job at Exil on Paul-Lincke-Ufer right away, which was conveniently located next door from the house I lived in. One night I met [Risiko owner] Alex Kögler and his girlfriend Sabina van der Linden in Exil and asked them about their venue Risiko at Yorckstraße 48 next to the S-Bahn bridges in Schöneberg. 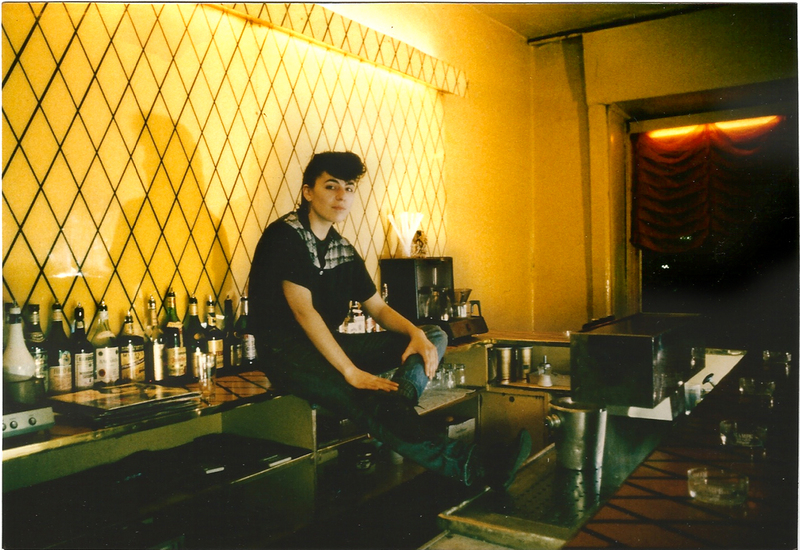 And soon thereafter I had a bar job for the reopening of the club, beautifully decorated in bright yellow and black patterns by Sabina, in May of 1983. In the dimly lit red back room and the so-called “kitchen,” lines as long as your forearm were served. On Saturdays, I worked the bar with Blixa. It seemed to be a highly prestigious job, even though Risiko, compared to the Dschungel, was more of a rundown, ratty kind of place. Due to the unusually loud and old-fashioned sound, everybody came here: Nick Cave, Birthday Party, Einstürzende Neubauten, Alan Vega, Die Haut, Malaria, The Swans, Die Goldenen Vampire, The Cramps, Gun Club, Wim Wenders, Peter Gente, Heidi Paris, Die Ärzte, Jörg Buttgereit, Mark Reeder, Jacques Palminger, Die Tödliche Doris, Mike Hentz, Christiane F., Tom Kummer, Richy Müller and all of their “pilot fish,” as I affectionately called them. Every night it was packed, the toilets were overflowing, and in winter it was freezing cold since a bar fight had left the window permanently broken. The late shift started at 9 p.m. and ended when the last customers left or fell asleep in the morning. In the long run, this way of life was only possible with the aid of best quality amphetamine. The two who were tending bar took strict turns ruling over the tape deck. I never left home without my own painstakingly mixed and elaborately labeled tapes, whether it was a recording of a John Peel show, rockabilly, Johnny Cash, Suicide, psychedelic garage punk, rare country music, or Lee Hazlewood. For a while we even had a record player, but it was eventually stolen with all our records, presumably by an angry drug dealer or disgruntled customer. Of course, we also had to play Alex Kögler’s favorite records: Roxy Music’s “Virginia Plane” and Frankie goes to Hollywood’s “Relax” were at the top of his personal charts. He also needed to hear “Let Me Down Easy” by the Stranglers, which was a big hit at the time, over and over at top volume. We had to play it 20 or 30 times in a row, with the coked-up crowd chanting, “Again! Play it again!” Those countless repetitions left lyrics and music burnt into our brains forever. Night after night we dug our way through pools of tapes, alcohol and drugs. The drinks were huge and a lot of people drank for free. Of course, this routine was tremendously self-destructive, which naturally we only realized years later. But fortunately, at least some people managed to create some art out of it. West Berlin resembled a fantastical stage before whose profound metropolitan scenery the crazy drug consumption and perpetual sleep deprivation created artificial drama as a means of escaping the latent complacency induced by the city’s special status. Cushioned in western amenities and a protective wall providing shelter from German normality, the cheap rent and low cost of living formed the framework to this really rather unglamorous city in its outsider position. Our fast way of living didn’t leave room for acknowledging the sad characters on the other side. We were only concerned about our own thing, never spared a thought about tomorrow. That was us: the utterly inconsiderate, but talented and well-dressed glamorous assholes of anti-culture. Read past Berlin Experiments on the fall of the Berlin Wall, the first Love Parade and more.